Brandon Stroh (left), principal at E.D. 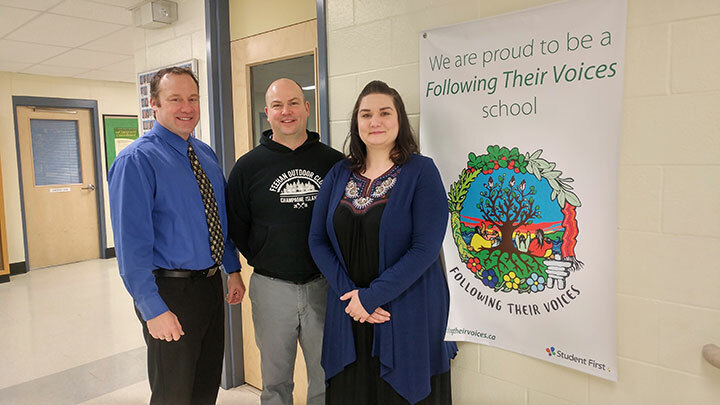 Feehan Catholic High School is an enthusiastic proponent of the Following Their Voices as is the staff, including trained facilitators Brett Monar and Alison Lowenberger. If you were looking for a ringing endorsement of the Following Their Voices initiative, have a conversation with Brandon Stroh. The principal at E.D. Feehan Catholic High School (Greater Saskatoon Catholic School Division) has been on board since the pre-pilot was started in 2015, and he’s been a passionate proponent ever since. “This has had the greatest impact on student learning that I’ve seen. I’m a science person so data is something I put a lot of stock into. Since we started this at our school, our credit attainment numbers are second to none,” he noted. He also attributes the steady enrolment increase in recent years to the fact that word has spread about the school’s commitment to Following Their Voices. Being principal of a school with a very diverse student population, including First Nations and Métis students for whom the program was intended, Stroh said anyone visiting the school will be able to see first-hand how the initiative has had a profound effect. Stroh indicated 40 percent of the student population is First Nations and Métis, while another 35 percent are English as an additional language. “I challenge anyone to walk around our building and not come away feeling our students have a voice. Students are central to this and giving them real voice in their education is what we are doing, which is what the whole initiative is about,” Stroh added. An integral part of how the staff have incorporated the initiative is to have classroom teachers regularly observed by Stroh and colleagues in a non-threatening manner. Stroh cited one teacher, who had been in the profession for 28 years, changed her practice after having conversations with her peers. “This is about teacher-to-teacher observation and there is zero appraisal attached to it. Then my job as principal is to resource the time and put in place the supports our teachers need. It’s a very open system with our staff. “I can’t speak highly enough about our staff and how they have bought in. They realize this is the right thing to do in terms of establishing those important relationships that need to be in place. That’s not always an easy thing to do, but it speaks to their commitment to the kids. My belief is this approach should be tried worldwide when you can see the results,” he added. “I can tell you our teachers are proud of what we have been able to do together as a group. I’m a strong believer that if you give teachers the time and resources, they can do some pretty special things. As a staff, we do a lot of professional development to look at better teaching strategies so that people feel comfortable. Our teachers are professionals with autonomy, and so that for sure has helped us on this journey. The bottom line is they feel valued and can see that this works. Stroh also lauded the support that he has received from both the Ministry of Education and the school division in implementing and continuing the initiative. He is a strong believer in the Truth and Reconciliation process and the Calls to Action that came out of that. “We know that for our First Nations and Métis students this is three or four generations, but we need to change the narrative. That starts by listening to them and giving them voice in their education. We need to live this approach every day if we want them to succeed,” Stroh emphasized. Stroh candidly acknowledged that there are possible financial implications for the program in the future when the province hands the costs over to divisions. “I’ve seen a lot of programs come and go in my 18 years in the education sector, and there’s no doubt that for our school this is working. Again, I go back to the commitment of our staff as being critical to its success. We need to get this right; it’s that simple,” according to Stroh.